Oh, Mama! This is a big one. Not only does this edition of Musing come with all our monthly staff recs (on a Mother’s Day theme, of course), but for the first time, it will also include the latest picks from our Parnassus Book Club, Classics Book Club, First Editions Club, and YA First Editions Club. Need something to read? Look no further. This stunningly blended mix of pictures and prose features essays by noted authors (including Edwidge Danticat, Barbara Kingsolver, Richard Russo, Elizabeth Gilbert, Susan Orlean, Alan Gurganus, Maile Meloy, Elizabeth McCracken, Jane Hamilton, and Billy Collins) alongside images by the acclaimed photographer Melissa Ann Pinney. A perfect gift for … well, just about anyone. The collection was edited by our own Ann Patchett. Make sure you’re subscribed to Musing, so you don’t miss our interview with Pinney next week. The story of Two starts on the third floor of my friend Melissa’s house, up the narrow stairs to her studio where photographs are framed on the walls and spread across tables and scattered and stacked on the floor. Giant cork boards cover two of the walls in the main room, and on those boards Melissa has pinned dozens and dozens of prints, each one containing some sort of pair: an elderly couple in a swimming pool, a woman with her dog, two winter trees cutting dark lines against the snow. I stood and looked at the wall. I’ve certainly had the experience of reading books that grabbed me from the first sentence, but I didn’t know I could be grabbed form the first image. I’d never encountered a book pinned up page by page before and I couldn’t take my eyes off of it. Every member of our First Editions Club receives a first edition of the selected book of the month, signed by the author. Books are carefully chosen by our staff of readers, and our picks have gone on to earn major recognition including the Pulitzer Prize, the National Book Award, and the PEN/Faulkner Award. There’s no membership fee or premium charge for these books; just the monthly cost of each book (+ shipping if you’d like yours mailed to you). Build a treasured library of signed first editions and always have something great to read! 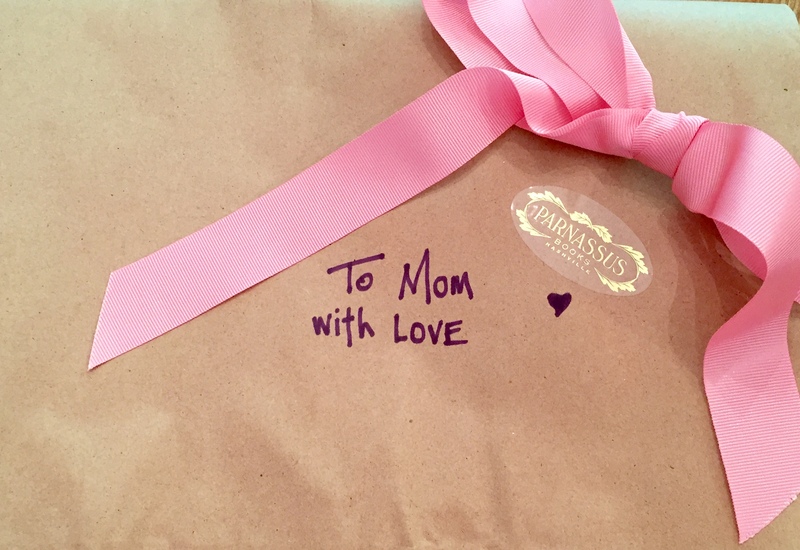 Makes a FABULOUS gift for mom — or anyone! There’s a particular kind of buzz that you hear a lot in the world of young adult literature, where a book is described as “the next ____________,” where ____________ is whatever YA movie adaptation has just done particularly well at the box office. 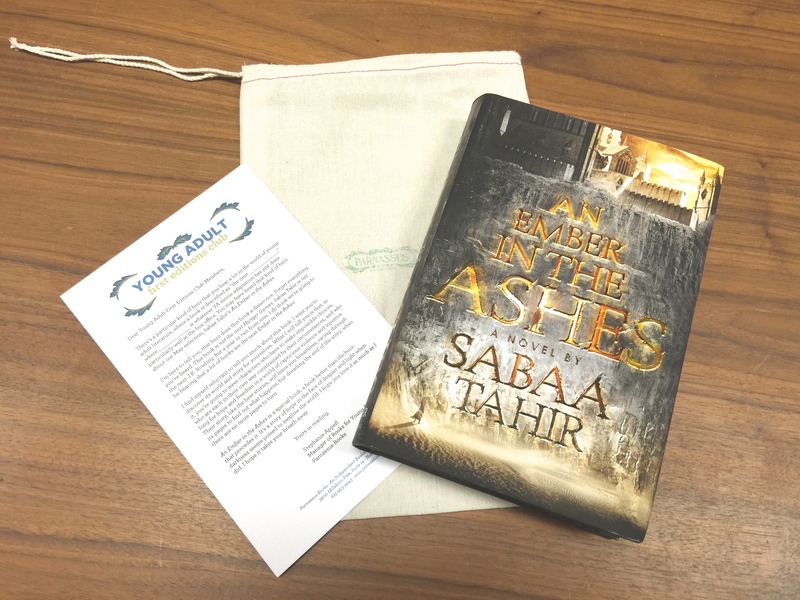 You may have heard that kind of buzz about our May selection, Sabaa Tahir’s An Ember in the Ashes. I’m here to tell you, that buzz does this book a disservice. Forget everything you’ve heard. This book is not the next Hunger Games. Sabaa Tahir is not the next J.K. Rowling. But a year or two from now, I do think we’re going to be hearing that a lot of books are the next Ember in the Ashes. I find myself reluctant to tell you much about this book. I want you to discover its world and story for yourselves. What I will tell you is that, in it, you’re going to meet characters who have to make impossible choices, who are each in their own way constrained by their circumstances, and who long for hope and freedom in a world of capricious violence and injustice. Their story, like the best stories, will leave you breathless, racing through its pages to find out what happens, but dreading the end of the story, when there are no more pages to turn. Every member of our YA First Editions Club receives a first edition copy of the selected book of the month, signed by the author. There is no cost to join the club other than the monthly cost of each book (+ shipping if you’d like yours mailed to you). When the hottest new books come out, you’ll have them… autographed! Choose a 3, 6, or 12-month membership for yourself or as a gift. Monday, May 18 at 6:30 p.m.
Wednesday, May 20 at 6:30 p.m.
Thursday, May 21 at 10 a.m.
Join us for a discussion led by the author, Lily King! Discussions held Tuesday, June 23 at 10 a.m. and 6:30 p.m.
Are you a member of our store book club? Would you like to be? Three bookaneers (literary pirates who steal writers’ manuscripts) sail to Samoa to steal Robert Louis Stevenson’s latest work and make a fortune for themselves. I loved Pearl’s The Dante Club and The Poe Shadow. Last month I read Flynn’s Sharp Objects. This one shows how she has continued to evolve as a writer, eventually hitting it big with Gone Girl. Here, the young survivor of her family’s murder tries to find the real killer 25 years later, hoping to free her imprisoned brother who was convicted long ago. I’m half-done and can’t put it down, and yes, it is very dark. The Gilded Age, Edith Wharton novels, Downton Abbey — I love all that. So I look forward to reading this story inspired by the unhappy marriage of Consuelo Vanderbilt near the turn of the last century when rich young women often were sent to England to marry aristocracy there. I lived in the Bay Area during the time of this memoir, the 1970s. Being at home with two babies, I guess I lived vicariously through the society pages of the San Francisco Chronicle and Herb Caen’s daily columns. This memoir by the son of one of that city’s society mavens (herself a thinly-veiled character in Armistead Maupin’s Tales of the City) promises to be an “exhilarating tour of life in the strangest, wealthiest, and most grandiose of families.” I lucked into this one for $1 at a library sale seven years ago, and I’m still looking forward to reading it. This one has all the elements of books I like: strong women, exotic settings, important historical discoveries. Plus, it has just been optioned for development by PBS Masterpiece. WGBH referred to the main character as, “the rare heroine of literature whose fortunes are neither rescued nor ruined by a man.” The author is Ann’s dear friend, too. What else can I say? I’m eager to give this one a try. Can’t decide on something for mom? Let us help! We love to make personalized recommendations. Or if you’d like to be on the safe side, you can always give a gift certificate and let her choose whatever her heart desires. She can use it in the store or online!